The Supreme Court ruled Tuesday in favor of President Donald Trump’s September order to restrict travel from several majority Muslim countries to the United States. In the 5-4 opinion written by Chief Justice John Roberts, the court found that Trump’s travel restriction fell “squarely” within the president’s authority. The court rejected claims that the ban was motivated by religious hostility. The case, Trump v. Hawaii, has been central to the administration’s travel policy, presenting a key test of the president’s campaign promise to restrict immigration and secure America’s borders. Trump, who issued the ban in September, hailed the ruling in the case. 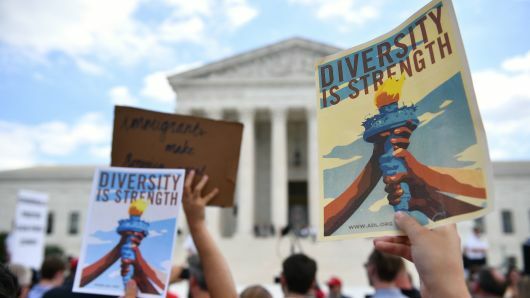 “The Supreme Court’s decision today was unsurprising,” said Stephen Yale-Loehr, the co-author of a 21-volume book on U.S. immigration law. Yale-Loehr signed onto an amicus brief on behalf of Hawaii. “Because immigration touches on national sovereignty and foreign relations, courts have generally deferred to the president on immigration issues,” he said. American presidents have “performed unevenly in living up to those inspiring words,” Roberts said. Trump has said the ban is not about Islam. “This is not about religion—this is about terror and keeping our country safe,” he said in January 2017, after facing criticism over the first version of the order. That initial order, signed a week after Trump’s inauguration, led to days administrative chaos and protests at airports around the country. It banned entry of people from Iran, Iraq, Libya, Somalia, Sudan, Syria and Yemen for 90 days and indefinitely halted resettlement of refugees from Syria’s civil war.